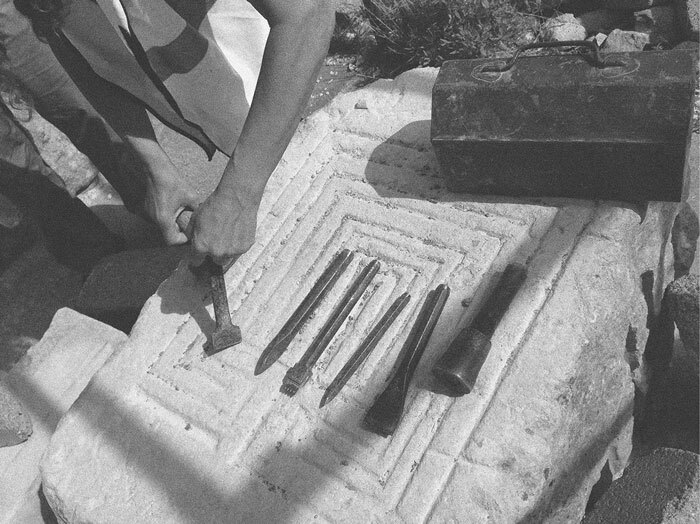 ‘Carving Time: When Creative Review went Stone-carving’. Hidden among the pathways of the old Tout Quarry on the Isle of Portland, the stonecarving workshop is easy to find once it’s in full flow. The tap-tapping of chisels on stone leads many walkers down to investigate the scaffold and tarpaulin structure under which the carving courses take place. Here, 14 or so flat-topped boulders – each a three-tonne ‘carving banker’ – are set out in two rows. It’s on these giant slabs that during the summer months small groups of people set up blocks of Portland stone and start to shape them. 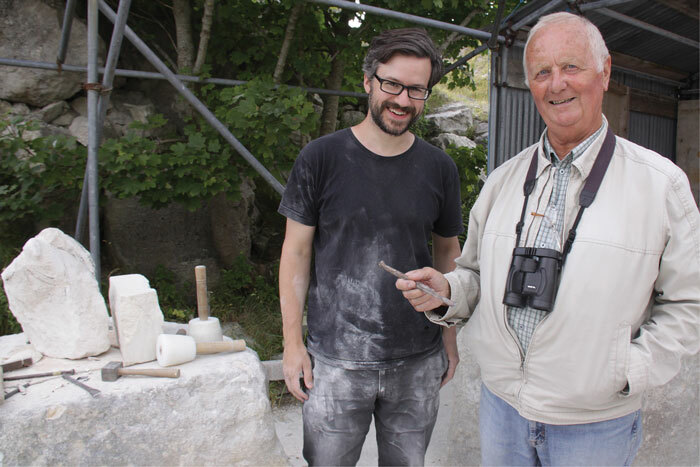 Tout Quarry on the Isle of Portland in Dorset is now home to a sculpture park, nature reserve and a series of stone carving workshops run by the Portland Sculpture & Quarry Trust. The architect Inigo Jones helped to bring Portland stone to London on an industrial scale in the early 17th-century and since that time the stone has been the material of choice for countless significant builds. From Wren’s St Paul’s Cathedral and the 1907 Port of Liverpool Building, to the UN headquarters in New York and numerous memorials and public sculptures, Portland stone’s clean pale colour has appealed to architects for centuries. It also weathers particularly well and, for carving purposes, is a kind of Goldilocks material: not too soft and not too hard. 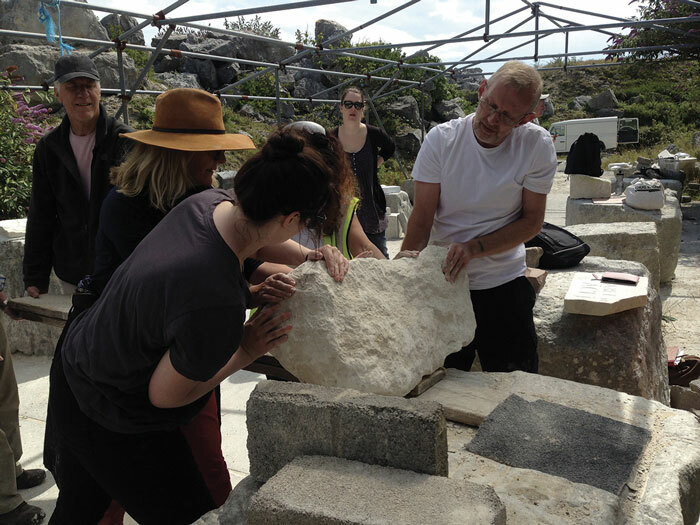 Artist Hannah Sofaer set up the stone carving courses at Tout in 1994 in an area of land towards the western side of the island last quarried in 1982. The 40-acre site is now a sculpture park and nature reserve and filled with over 60 artworks. 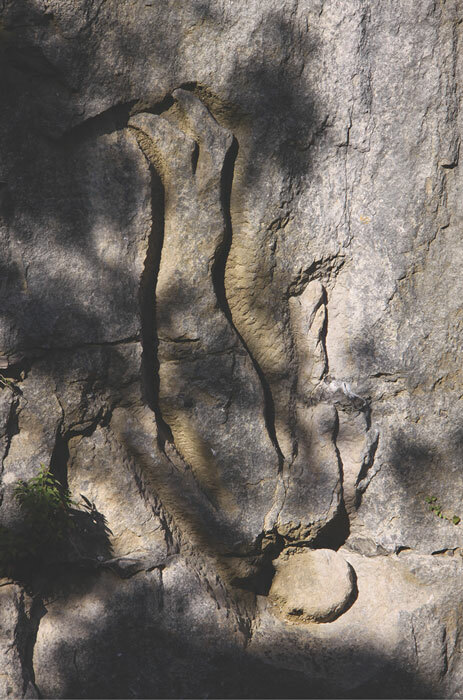 Some are easy to find, like Sir Antony Gormley’s Still Falling (an upside-down figure carved the year the park opened in 1983) but many are hidden in the rock, or have gradually been reclaimed by it. A piece by Pierre Vivant uses negative space to suggest the form of a column; there’s a fireplace by Timothy Shutter; a body lying on its side; various faces dotted about the area – and even some surprises left by the quarrymen. When we first tour the site, Sofaer leads us to an underground hideaway she has recently discovered. Inside there is a small stone hearth with a chimney leading up and out to the surface. Time is mentioned a lot down here – the geological age of the rocks we’re handling, the way that cutting through layers of the stuff in the landscape takes you back millions of years. The course itself begins at the Portland Sculpture and Quarry Trust’s base at the Drill Hall, a vast project and exhibition space which has a stunning collection of fossils that have been unearthed from nearby quarries. Sofaer describes the geological make up of the island in some detail before we walk to the sculpture park and set up in the workshop area. Demonstrating some of the basic carving techniques on a sample stone, artist and stonecarver Paul Crabtree takes the wider view on what it is we’re working with. “We’re now in an area that was [once] somewhere else on the planet,” he says. “We’re still moving north and eastwards, the Atlantic is getting wider”. Time is mentioned a lot down here – the geological age of the rocks we’re handling, the way that cutting through layers of the stuff in the landscape takes you back millions of years. As I’m only here for the day (regular courses last a weekend, a week or four weeks), Sofaer advises that I find a stone to carve that already suggests something of what it might become. We find a large lump in the pile brought down from the Perryfield quarry and, as she draws a few lines in charcoal down its sides, it begins to take on the semblance of a bird. Quite what kind of bird it is, let alone what it’s doing – perching, flying? – is perhaps something we can try and tease out of the rock. It looks like quite a challenge, but I’m already eyeing-up the tools. The ability to get so much detail in Portland stone comes from its structure, Crabtree explains. Portland stone is an oolitic limestone with a fine grain of calcium carbonate, meaning it can be finely carved in any direction. It’s made up of egg-shaped particles, he says, and the density of a particular piece of stone is dictated by the gaps between these ovoid shapes. (With less of a gap, the stone is more dense. Broadcroft, for example, is one of the hardest on the island.) 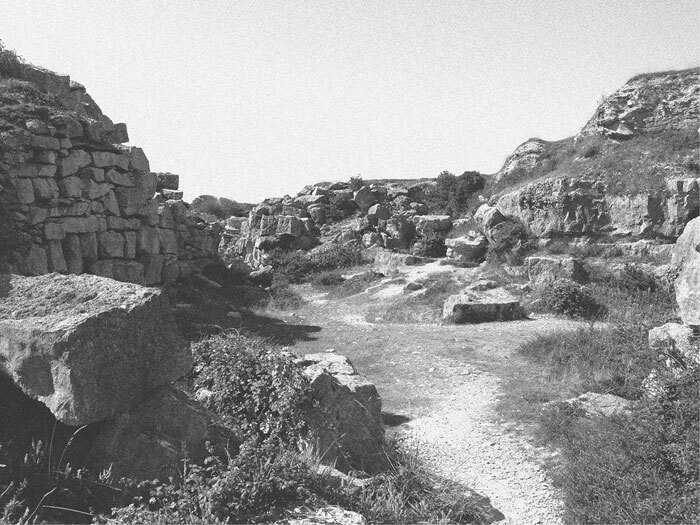 And no two quarries on Portland will produce the same kind of stone as no two ‘beds’ are exactly the same. In fact, the limestone that we call ‘Portland’ mischievously leaves the country to the south of the island, running into the English Channel and carrying on and up into the Cherbourg Peninsula in France. The chisels have their own song, too. By the end of the week a distinctive rhythm emerges as people fall into a particular pace of working. Alongside the sense of focus and detachment from the world that carving the stone brings, one of the most surprising things about the workshop is the sound of it. Hitting the stone with a mallet produces a strangely metallic ring like a bell, to the extent that a good mason can even tell if the inside of the stone has a fault and may cause problems later on in the carving – the ‘bad’ sound is like a broken tea cup, Crabtree says. The chisels have their own song, too. Sofaer adds that by the end of the week a distinctive rhythm emerges as people fall into a particular pace of working. Everyone hits the stone differently, she says, as someone behind us makes a series of two quick taps in succession while another overlaps them with three slower hits. CR’s Mark Sinclair, on left, and local legend David Frost, a retired mason who worked in Portland. Frost’s work features in the repaired Whispering Gallery in St Paul’s Cathedral and he has donated many of his tools to the PSQT workshops. While there are many established techniques to follow – and one’s material is a dense and unwieldy piece of rock – it’s clear that carving stone allows a lot of personal expression. Both the tutors help me to refine as much of my efforts as possible (Crabtree adds in eyes while Sofaer works on the wings) and as I leave the site with the stone in the boot of my car – the bird still encased in the stone – I feel tired but invigorated. Sofaer is right; the light and the air in this part of the world must be good for you. As is a day of getting covered in fine white dust and listening to the sound of hard work echo around a unique landscape. 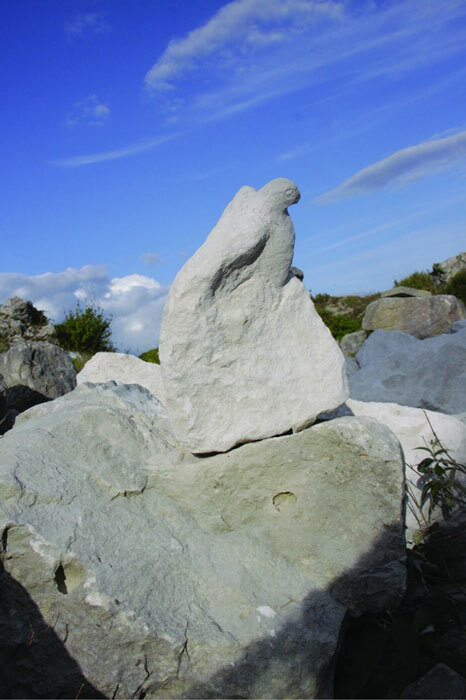 Portland Sculpture & Quarry Trust’s courses run all year round. Two-day weekend workshops start at £116, while a one-week workshop is £250. Fees include tuition, use of tools and provision of freshly quarried stone.